We have many thousands of troops every day placing their lives on the line serving in hostile countries. They are doing what their forefathers did before them. Each are willing to lay their lives down in service to their country. So, we living in our beautiful country, can have the right to moan and holler, to protest, to go to school, to work and live where and how we want. Rights, we have way to often taken for granted. 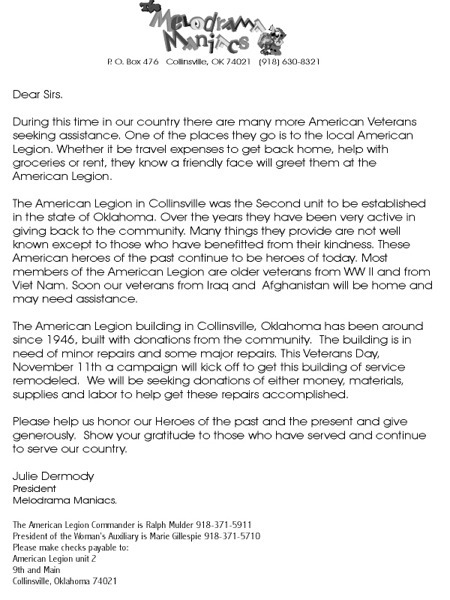 On Tuesday, November 11, 2003 at 11am, a parade will start at 14th and Main in Collinsville and travel to the American Legion Building at 9th and Main. This parade will honor those armed forces of the past and of our present. Leading the parade will be WWII vets, Korea Vets, and Viet Nam vets, carrying our glorious American Flag. After the parade a brief rally to recognize those who have served so bravely will be held in the parking lot of the American Legion. You and your families are invited to attend. 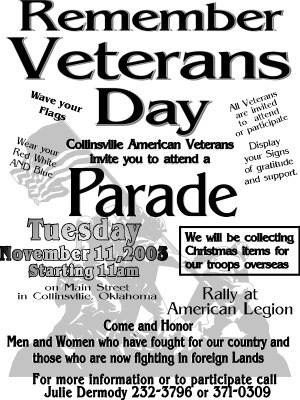 All Vets are invited to come and participate and let Collinsville, Oklahoma show you how grateful we are for your service to our Nation. There will also be a collection station for Christmas boxes for soldiers currently serving in Iraq and Afghanistan.